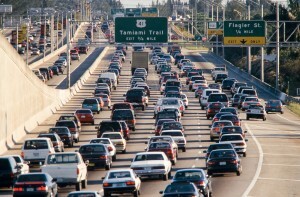 Traffic could cause roads: greater traffic leads to greater expenditure on roads. Or roads could cause traffic: greater supply of roads leads to more driving and hence traffic. Which way is it? candidate tool to curb trafﬁc congestion. Cool. So these dudes are doing for traffic what Levitt did for crime in his 1997 AER that set his freakonomics career in motion (but they do not cite him). Next up on this agenda: do miserable economic times cause more economic PhDs or do more economic PhDs cause miserable economic times? Instrument: an unexpected increase in NSF funding for economics…. Is that saying that new drivers appear to replace the ones who start using transit? where do these new drivers come from? All that Duranton and Taylor prove is that you can get a useless answer if you ask the wrong question. No one is interested in congestion as such. People are interested in how long it takes to get from A to B. Building highways between population centers improves that, more mass transit improves that, building better roads improves that.